Jeff Shapiro admits he should have known better about wildfire precautions. He is, after all, a fire protection engineer. Shapiro got his wakeup call in 2011. The catastrophic Bastrop County wildfire of Labor Day weekend in 2011 burned 32,400 acres and destroyed almost 2,900 buildings – most of them homes – southeast of Austin in central Texas. It’s described as the most destructive wild land urban interface wildfire in Texas history. During the same weekend, wildfire destroyed 23 homes in the Steiner Ranch community on the northwest side of Austin. Shapiro lives just five miles away in Jester Estates. Before Bastrop, it had been decades since the last wildfire in the canyon behind his house, Shapiro says. “When I purchased my lot in 2000, everything was wet and green,” he adds. No one in his neighborhood really thought about wildfires, including him. But the hot, dry climate change and Jester’s position atop a plateau surrounded by fire-friendly wild land raises the community’s burn potential. So Shapiro got to work. He installed a fire sprinkler system in a home already constructed of fire-resistant concrete board and stone, and Class A fire-retardant asphalt shingles on the roof; trimmed low-hanging branches on trees to make “fuel breaks” that slow a fire’s upward climb; and created open spaces between pockets of trees instead of having continuous vegetation that would feed a fire. But wildfire protection requires community action to be most effective. Though Jester Estates is now a “Firewise Community,” a designation by the National Fire Protection Association, not all homeowners have embraced the effort. “People are apathetic if there hasn’t been a fire recently and, if there has been, there’s a denial factor,” says Shapiro, chairman of Jester’s Firewise Community safety committee. “There seems to be an expectation that the fire service will save you.” But depending on the number of fires and fire-fighting resources, that protection may not arrive, he adds. From a firefighter’s perspective, Justice Jones says homeowners who followed recommendations to protect their homes during the Bastrop fire had a greater ability to survive the fire without firefighters’ help. “That’s not to say that firefighters won’t make every effort to defend homes. But applying these tactics improves the chances of protecting the structure,” says Jones, Fire Adapted Communities coordinator for the Austin Fire Department’s Wildfire Division. In addition to Shapiro’s precautions, Jones offers these tips to protect your home. Embers are the biggest danger. Install ember-resistant roof and foundation vents or 1/8-inch metal mesh behind the openings. Check local building codes first. Remove leaves, pine needles and other combustible material from gutters. Create a barrier surrounding the house, and decks and porches, that’s free of mulch and other combustible material. Protect your home with non-combustible roofing and siding material. Editor’s Note: Celebrate National Wildfire Community Preparedness Day on Saturday, May 3, a national effort to reduce wildfire risk through volunteer cleanup and clear-out projects. Terry Sheridan is an award-winning journalist who has more than 30 years of experience in reporting and editing for newspapers in the Chicago and Miami areas. She covered the aftermath of Hurricane Andrew’s devastation in 1992 in South Florida, and has experienced damage to her own homes from two hurricanes. She now lives in New Hampshire. 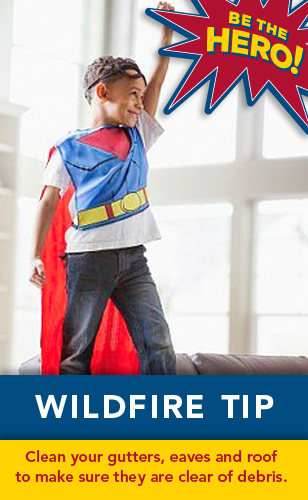 Create a defensible space by landscaping with fire-resistant plants and removing other fuels. Follow us on pinterest for more tips during National Preparedness Month. 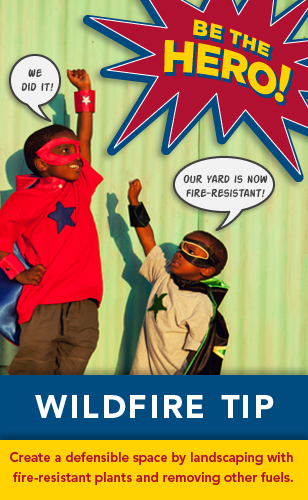 You can help protect your home and property from wildfire by doing yard work and home maintenance before fire season. REMEMBER severe wildfires move fast and embers can be blown more than a mile from the flames so be ready.